Human-muscle-powered Flight: Possible or a myth? just kidding, hope it wont get that mundane. Well we all know the story of Icarus and Daedalus; for those who don’t, here’s a short review - Daedalus is a brilliant inventor—the Tesla of his day. Disastrously, he angers King Minos, the ruler of the island Crete, and he has to abscond out of there. With no hope left, he finally decides to fly out of there with his son using wings made up of wax. 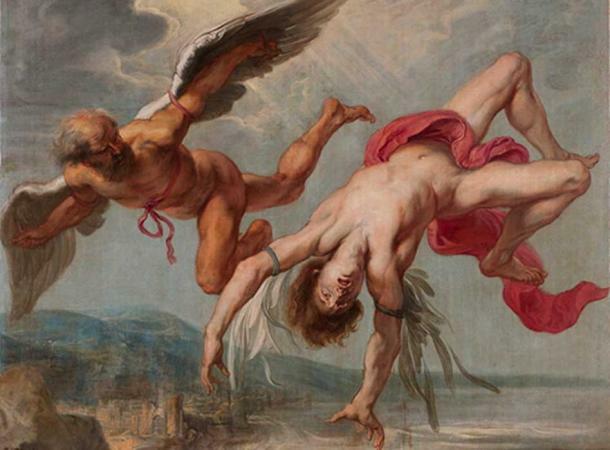 Daedalus warns his son to fly at a middle height: the seawater will dampen the wings and the sun will melt them. Icarus, overwhelmed with the joy of flying, forgets the warning and flies too close to the sun. Sure enough, his wings melt, and poor Icarus plummets into the sea and drowns. Frustrated for not being able to help his son and devastated at his death, he flies to Sicily, mourns for his son and built a temple in honor of the god Apollo. As a child, the only part of the story that fascinated me was that they flew using an artificial wing made up of wax (which is probably the worst material for building wings), wow! That’s cool. I was also tempted to do so and I also built a prototype out of fabric and sticks (the only materials I could use without getting into troubles). Now I thank myself for not being dumb enough to jump off my roof top. I was always curious about birds’ flight and spend hours watching them fly. 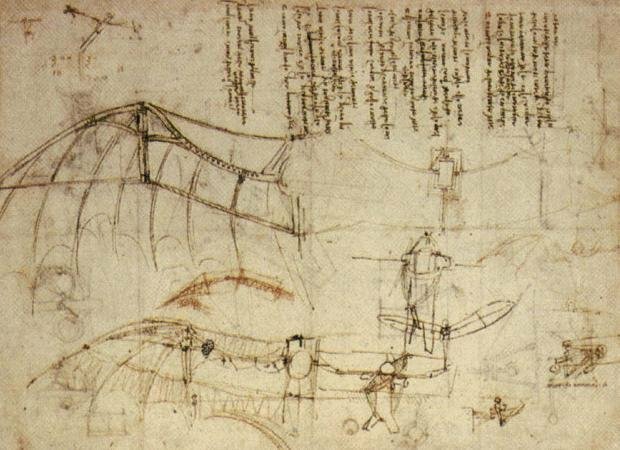 Growing up, I learnt that the idea of human powered flight by flapping wings was a concept much older, dates back to about 1485; famous painter and inventor Leonardo da Vinci. He actually made designs of many man powered ornithopters (device that flies by flapping its wing) which are remarkably similar to modern day flyers. Moreover, his idea wasn’t a completely muscle powered flight, it was although powered by human muscles but was aided by mechanical means. At present, many man-armed-muscle-powered orinthopters have successfully flown but all of them use some form of mechanical system driven by muscle energy or other means. So the question still prevails, can we ever attain human-muscle-powered flight like a bird??? Before directly jumping into answering this question, let us first understand the essence of the problem. Built to fly, aren't they??? Air sacks that connect to lungs, which enables them to extract much more oxygen for flight (avian respiratory system is the most efficient in the animal kingdom). The airfoil shape of the wing isn't much of a problem as we can easily build one. Flight of bird is a really power intensive mode of locomotion. As they are equipped with the most energy efficient respiratory system, it isn't a problem for them, but for us it can be a major drawback as our respiratory system isn't designed to supply enough oxygen to produce energy for flight. It seems as it the birds are precisely engineered to be lightweight. This problem doesn’t seem that intense, for extra weight, we can build a larger wing inspired by the fact that larger birds have larger wings to produce more lift force to compensate for increased weight. Does this actually solve the problem? Not exactly, we’ll discuss this later. Before explaining it further, let us discuss about the physics: aerodynamics involved in the flight of bird. For time being, let us constrain our discussion to gliding of birds only that excludes the complicated nature of flapping motion. Actually, it isn’t required to understand the physics of flight to answer our question of human flight, but discussion about flight seems incomplete without it; you can skip this portion in case you find it too technical to understand. The cross section of the wing is airfoil shaped with cambered profile. When air flows across such wings, the air follows the surface of the airfoil, hence is deflected downwards. This change in direction of velocity direction develops force, How??? Newton’s third law: to every action there is equal and opposite reaction. The wings exert force on the air by deflecting it downward, so the air exerts equal force on the wings and lift it upwards as shown in the figure below. Pardon me for the sketched figures, I couldn't find one without copyright issues and am really bad at photoshopping but quite good at improvising :D .
But if they can generate lift force without flapping, then why do they need to flap??? The lift is produced only when air flows over the wing. The aircrafts are provided with large engines which generate thrust to propel them forward. So the gliding flight of the birds eventually slow them down, as seen, so they need to flap their wings to generate thrust force which overcomes drag and propels them forward. The actual physics of lift and thrust generation by flapping involves vortex formation and circulation and is quite intricate and also not the scope of this discussion (probably in future posts), so we exclude it for now. Birds power flight primarily by large pectoralis muscles that depress the wings at the shoulder. The humerus is relatively short and stout, this is because the main flight muscles are attached to it hence it must withstand large forces during flapping. The avian hand has only three digits which control the shape of wing for extra lift just like the leading and trailing edge flaps of modern day aircraft. 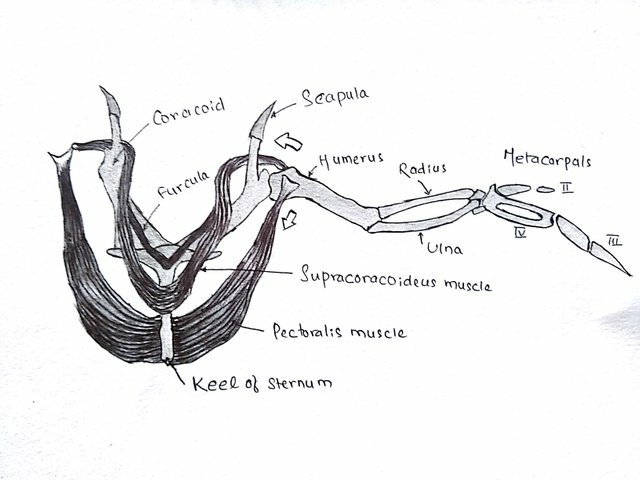 The supracoracoideus muscle originate at the keele of the sternum passes through the triosseal canal to insert on the dorsal surface of the humerus, producing the upstroke of the wing. The pectoralis also originates from the kneele of the sternum and inserts on the ventral surface of the humerus, producing the down-stroke of the wing. The pectoralis, which produces force for flapping, are so massive and strong that it account for around a third of bird’s weight. Also birds have muscles which can deform the shape of the wing for better maneuverability and drag reduction. Are we too big to fly??? Nature has always been a great source of inspiration for us. Even our idea of flight was first inspired from nature. Let us look into it , was there any organism that was as big as humans and was able to fly (‘was’ because of course we don’t see one around)? 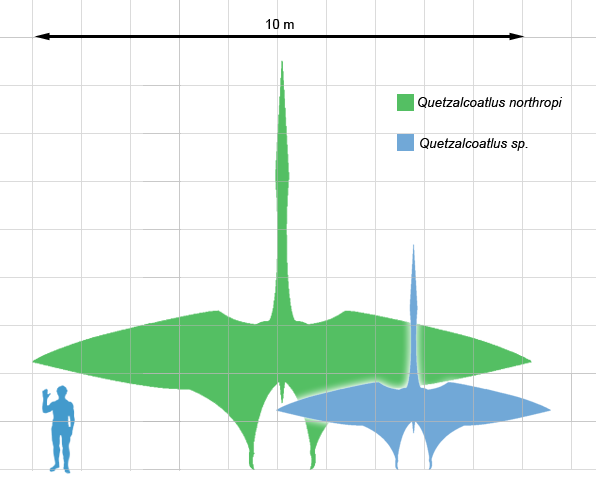 It’s actually a dinosaurs called Quetzalcoatlus whose estimated lowest weight was around 70 kg with a wingspan of around 10 meters. It means that we aren’t too big to fly; cheers!!!! The weight is comparable with the weight of average human being, so can we fly when we build an ultralight wing made up of graphene (substance with largest strength to weight ratio) which spans 10m (for time being, let’s exclude the weight of the wing)? Sadly, the answer is still no, we can’t fly. The thing is that the problem isn’t with the size of wings. I mean we can surely build a larger one. The actual problem is have we got enough strength to sustain our weight by flapping the wings i.e. are our arms’ muscles strong enough to make us fly??? The arms and chest of a human do not have anywhere near enough muscle mass to provide the necessary power for flight i.e. we have low strength to weight ratio, lower than that of a bird, even lower than that of a child ( I know the feeling :p ). This is because the rate at which we gain weight as we grow up is more than the rate at which our strength grows. This is the reason why a 6 years old boy can do more pull ups than his 40 years old father – he may be weak but his strength to weight ratio is still greater than his father’s. We aren't too big to fly, neither are we too heavy to fly, the thing is that, we aren't strong enough to fly. So, the gains we’ve made as an inspiration from birds has not easily been achieved. We have had poets write about it, we have had painters paint it, we have had singers sing of it. But then we have had Engineers and Scientists who have actually made it possible. Flight is now achievable by humans. Not as birds though but inside an aircraft. And of course there are the skydiving lunatics. In reality, nature has its way to beat us, to amaze and inspire us. Our present day most advanced flying aircraft by far (‘by far’ isn’t just enough to describe it) cannot compete the level of sophistication, control, maneuverability and stability birds possess. But anyways, our story of flight is one of struggle and we need to appreciate nature for engineering what we are able to copy from. Cheers!!!! If you made it this far. Hope it was informative and you learned something new from this post. Shreyas, J. V., Devranjan, S., & Sreenivas, K. R. (2012). Aerodynamics of Bird and Insect Flight. Journal of the Indian Institute of Science, 91(3), 315-328. 2.Dvořák, R. (2016). Aerodynamics of bird flight. In EPJ Web of Conferences (Vol. 114, p. 01001). EDP Sciences. No Copyrights were Violated. Free Images labelled for commercial and non-commercial purpose were used. The images without the source are sketched by me. This is an awesome breakdown! I do think that with a lot of training we might be strong enough though? Say... enough training over severe generations to entirely re-engineer our skeletons for this exact purpose? Thank you so much @tfcoates. Pardon me for replying late. Congratulations @sahchandan, this post is the third most rewarded post (based on pending payouts) in the last 12 hours written by a Newbie account holder (accounts that hold between 0.01 and 0.1 Mega Vests). The total number of posts by newbie account holders during this period was 5190 and the total pending payments to posts in this category was $4049.85. To see the full list of highest paid posts across all accounts categories, click here. Congratulations @sahchandan! You received a personal award!